data "C", "h", "l", "o", "e", " ", "G", "r", "a", "c", "e"
data " ", "M", "o", "r", "e", "t", "z", ",", " ", "I", " "
data "l", "o", "v", "e", " ", "y", "o", "u", "! ", chr$(13), "I"
data " ", "w", "a", "n", "t", " ", "t", "o", " ", "m", "a"
data "k", "e", " ", "l", "o", "v", "e", " ", "t", "o", " "
Converting webp to PNG with a bash script to make life easier. echo "The file does not exist." Mistake: I didn’t bookmark the website I found it…. lol. The following program (written in C++) creates a filter program for converting ascii into ROT13 encoding. A very simple cypher where each character in the alphabet is replaced with the 13th letter from its position. To download a compiled windows compatible binary, click here. Lately I been using a dialect of the LOGO programming language (papert). 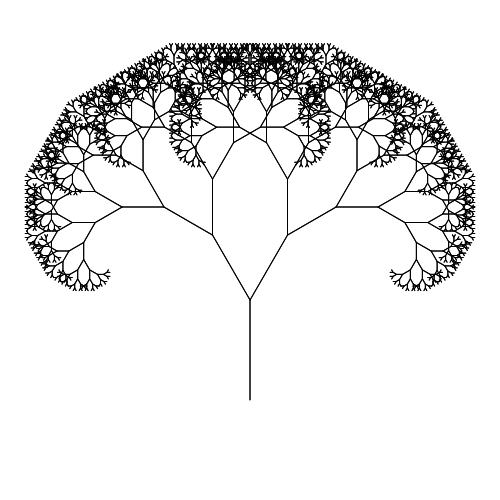 Today I wrote a fractal tree drawing which I am impressed after trying to get the angles right, based on a earlier experiment that used 45 degree angles this one is based on a more natural looking 30 degrees. The result is a very impressive looking tree. I also made one that utilized random numbers to modify branching as to make each tree imperfect and each unique much like real trees. But I have to admit that the perfect one looks the most impressive. As you can see it is a very impressive program, short but produces a beautiful output. Please note I had to put a space after the colon in the source here so that it would not change into smileys. Ok, as my previous post showed how to write a routine oriented hello world program in gforth, I now explain a hello world program using objects in object oriented rexx (ooRexx). It contains two methods, a constructor and general purpose method named “print”. Both objects share a variable common to the object called “hellostring”, which contains the string we want the object to print. It is initially set by the constructor to the value “Hello World”. The print method does only one thing, to print the value of the variable “hellostring” to the console. So, here we have an illustration of using objects, methods, constructors and internal data passing between objects in a rexx program. (Note, I am not going into the details of what is object oriented programming, as if you reading this you should have already studied what is object oriented programming). The beginning part of the program does two things, create an object named “myobject” of the type “hello” and initialize it. The second instruction calls the “print” method. One of the issues of most of the information out there with respect to the forth language (and this includes books) is the lack of a clear illustration of how to write a routine and call it in the program in a easy to understand manner. They show how to write a routine and call it from another routine but no one tells you where your main program should be to call all the functions… do you create an main() like routine, do you put the instructions at the beginning and the routines after, or do you define the routines and call them after…. most of the forth manuals seem to skip this part in clear english. I am not a anything like an experienced forth programmer, but like all experimental programmers, I am interested in all programming languages, including forth… while most of what I might do is in other languages, I would like to say that I know something of forth, but most of the information out there leaves a lot to be desired when you do not “know” forth. Anyway this is my illustration of routine calls in a forth program. Ye old “Hello World” program. I believe all first “Hello World” program in any programming language should illustrate how routines (subroutines or functions) call called. So what does this program do? First it defines a routine called “hello” that does only one thing, print the text string “Hello World” with a carriage return. With respect to forth, the routine must be defined before being used, so it comes before any instruction that calls the routine. This is why the rest of the program follows the routine. BTW the routine definition is terminated by the semi-colon. (Note all colons and semi-colons are spaced away from any other element, as forth needs a space when parsing to determine it sytnax). There is no main() like construct in forth, so the instructions are listed right after all routines are defined. We therefore have two instructions: “hello” and “bye”. “hello” calls the hello routine and executes it before passing it off to the next instruction “bye” which in gforth tells the forth environment to terminate, exiting the program. There you have it, a gforth “hello world” program that illustrates the use of routines in the source program.